The first international meeting of the IAS held across the border in Hamilton, Ontario, on October 27-30, 2011. The four-day agenda showcased presentations by native artists (two from the Arctic and one from Labrador) and academics along with a full-day field trip to locations in Hamilton, Mississauga, and Toronto. His uniquely stunning sculptures were featured in a solo exhibition entitled Visions from Labrador held at Spirit Wrestler Gallery in Vancouver during the fourth quarter of 2010. His emerging talent was recognized last year as well when he was awarded the CBC Emerging Artist Award by the Newfoundland and Labrador Art Council. Billy was born in 1978 in Happy Valley-Goose Bay, Labrador and is of Inuit and Métis descent. He uses a variety of materials which reveal personal memories as well as insights on traditional life in Labrador. His sculptures vary in size but are all intimately carved with delicate detailing and inlays. You can read his complete story and see many of his pieces on the Spirit Wrestler website. Photos and bio courtesy of Spirit Wrestler Gallery, Vancouver. Tim Pitsiulak has been drawn to the arts and various forms of artistic expression for many years. He started to draw as a young boy and later took up carving as well. He has also participated in jewelry-making workshops offered in Iqaluit. Born in Kimmirut (Lake Harbour) in 1967 to Napachie (deceased) and Timila Pitsiulak, Tim has been living in Cape Dorset for several years now and has enjoyed working in the lithography studio with visiting arts advisor, Bill Ritchie. The land and its wildlife were initially the primary influences on Tim’s realist drawing style. More recently he has become a chronicler of the everyday, drawing lar ge format, meticulously detailed depictions of boats, heavy equipment and airplanes – the machinery of modern life in Cape Dorset. This year Tim returns to his love for the natural world with Vigilant Wolves, an intriguing lithograph depicting two wolves patiently waiting out the herd of caribou under the midnight sky. Tim will enjoy his first solo exhibition at Feheley Fine Arts in Toronto this fall. Bio courtesy of Dorset Fine Arts, Toronto. Mathew Nuqingaq grew up in Broughton Island, but now lives in Iqaluit with his wife Darlene and his dog Napuq. He has always been interested in being an artist even when he was a child. He started making jewellery a couple of years ago when he decided to register for an evening course at Arctic College. He enjoyed it very much, and since then has taken quite a few courses. He is now studying jewellery part-time and teaching part-time at Joamie School as a Culture Instructor. He teaches the children how to work with wood and how to make traditional tools. She serves as a Research Collaborator for the Smithsonian and is an honorary board member of the NACA – Nunavut Arts and Crafts Association. When she is not curating an exhibition, lecturing at universities and museum all over the globe or visiting the Arctic, she can be found at her gallery, Arctic Inuit Art in Virginia. 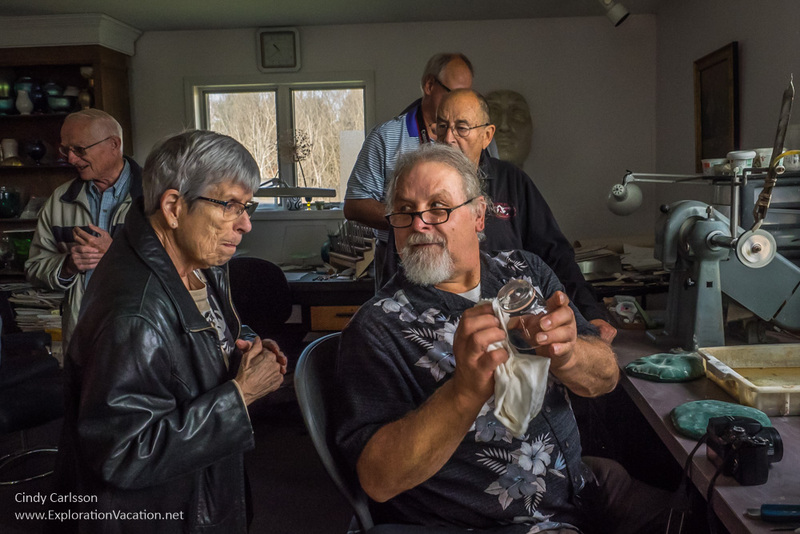 Judith Varney Burch serves as a Research Collaborator for the Smithsonian National Museum of Natural History and recently opened Arctic Inuit Art, an art gallery and learning space for the community to explore the Arctic. The gallery is located at 22 Elliewood Avenue (Charlottesville, VA) and is open to the public by appointment. Additionally, Burch curates exhibitions and lectures around the world. Recently, PCA was lucky enough to have the chance to visit the gallery and talk with Burch about her experiences. How did you first become interested in Inuit art? My first exposure to Inuit art was while spending summers at our home in Nova Scotia. I was immediately taken with the unique and powerful imagery depicted in the art. It just spoke to me. What is your background in the arts and how did you get involved in curating and running a gallery? The gallery, like most things, was the result of a culmination of interests. Majoring in sociology at Duke led to years of community service. I did my best, in various capacities, to make a difference for those who had been marginalized in our society. In addition to the social work, appreciation of the arts led me down the path of a docent at the Virginia Museum of Fine Arts in Richmond, where I specialized in European tapestries and Hindu art. Prior to Richmond, I had been a docent at Winterthur Museum and the Delaware Art Center, while living in Wilmington, Delaware. It was through this combination of interests in the arts and disenfranchised people that I felt the pull of the Inuit. The art was powerful and the people were all but invisible in the United States. Please explain the types of art at the gallery and those that you consider to be the most interesting that you have studied. Is it mostly visual art or are you interested in the performing arts as well? You have been working in the field for over 25 years and have given talks at the Smithsonian and curated many traveling exhibitions. How have you witnessed the evolution of Inuit art and culture over that time? I would first have to say that the time I have devoted to Inuit art and culture, over the past 25+ years, has been deeply fulfilling. To the question of the evolution of the art, I would say it is not so much the art but its recognition that has evolved. 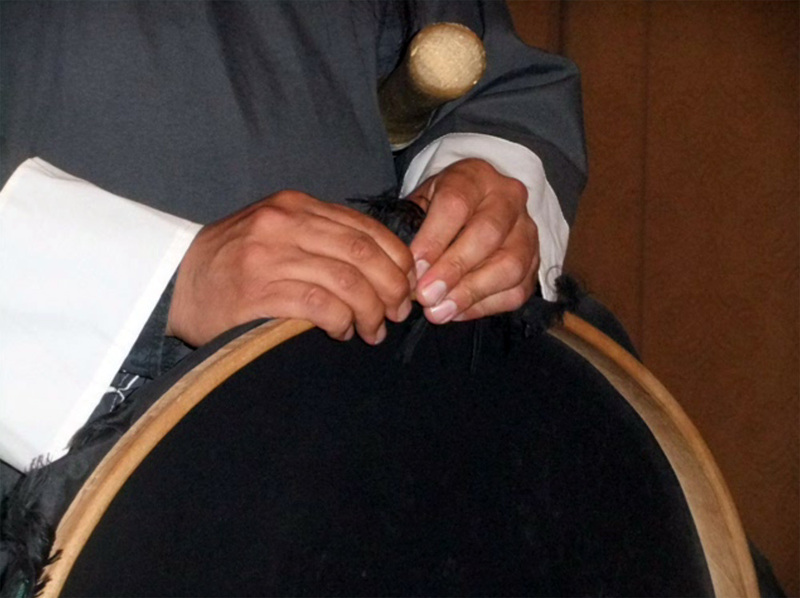 This extraordinary art tradition has emerged as a lasting bridge between the remote Inuit culture and the rest of the world. With increased respect from the outside world comes increased self respect among Inuit artists. Today this has led to opportunities for younger Inuit artists who are examining their lives and our planet from uniquely Inuit perspectives. Do you see a great amount of overlap between Inuit art and other aboriginal art forms? Naturally. In the more primitive or aboriginal cultures, though the environments may differ, many of the themes remain a constant. One example of a shared tradition is the transformation theme. The relationship between man and animal is often depicted by the combination of forms. 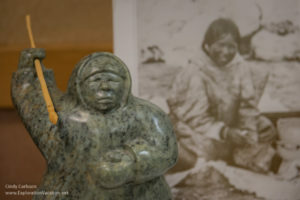 These transformation figures evoke the powerful connection of the Inuit to their surroundings. Tell us more about your travels to research and experience Inuit culture! Where was your favorite place to explore? What is your most memorable moment from your journeys? Oh my, the list is long. It began with a Canadian government grant, more than 25 years ago, from the head of the Inuit Art Section of the Bureau of Indian and Northern Affairs. I spent 7 weeks traveling on my own all over the Arctic… the inoculation that took. An incomplete list of work in the north would include: multiple trips funded by Nunavut to the Arctic and the NorthWest Territories, judging art exhibitions in Rankin Inlet (west of the Hudson Bay) and elsewhere, lecturing on Smithsonian and other educational/cultural trips north, board meetings for the Nunavut Arts and Crafts Association and the trips I have taken on my own to cultivate the personal relationships, which I so value, in the north. Some of the meaningful memories that come to mind: being asked to live in Eskimo Point/Arviat by an Inuit elder, [giving] a gift of a stone to the artist Mary Pudlat from the remote island where she was born… I was later asked to write Mary’s obituary, hosting a number of Inuit artists here in the U.S., being asked by Kenojouak whether our pot roast was grizzly or polar bear. At this point, I enjoy countless personal memories and close personal relationships with families in the Arctic. I will also mention, that eating raw caribou or raw seal for dinner is not something I have repeated very often in Virginia. Promoting the Inuit culture and their art around the world is my guilty pleasure. I have curated numerous exhibitions and lectured at universities and museums over the years, including one at the Bayly, here at UVa, about 15 years ago. However, it is the relationships forged through the Canadian Dept of Foreign Affairs and theArctic Studies Center at the Smithsonian Museum of Natural History that have been the main stay of my traveling exhibitions over the past decade and hopefully into the future. My passion is sharing Inuit art and culture. Combining that with my love for travel has been a gift that keeps giving. My Inuit textile collection, ”Culture on Cloth: Baker Lake Wall Hangings“, has traveled the world. I most recently opened the exhibition in Patagonia, Argentina. My travel/lecture schedule is one of the reasons that I don’t maintain regular hours in my new gallery location on the Corner. The gallery is open by appointment and by chance… so it is best to call ahead. Emily Cowall has done extensive research on tuberculosis among the Inuit of Canada. Her doctoral dissertation at McMaster University, PUVALLUQATATILUTA: When We had Tuberculosis St. Luke’s Mission Hospital and the Inuit of Cumberland Sound Region 1930-1972 includes important understandings of the Inuit experience at the former Mountain Sanatorium in Hamilton during 1953-1963. Part of Emily’s research was the repatriation of historic photographs of Inuit tubercular patients at the Mountain Sanatorium back to the community of Pangnirtung, which has spearheaded an arctic wide project to bring the images home. Emily Cowall went to Pangnirtung Nunavut in 1985-86 and lived as a community member enjoying the opportunity to share in all aspects of Inuit life. She returns annually to spend time with friends, and recently to conduct the community based multi-year participatory research projects. Her friendship with Noah Maniapik started in 1985 and has remained throughout the years. A studio-trained artist working in oil medium, Emily and Noah recently collaborated on producing prints that feature Emily’s drawings interpreted by Noah as the printmaker. Emily lives in Hamilton, lectures at McMaster University and provides project management locally and in high arctic base camps. Over the course of his career Tom Smart has held positions in art galleries and museums across Canada and the United States, among them the McMichael Canadian Art Collection, where he was its Executive Director, The Frick in Pittsburgh, the Winnipeg Art Gallery and the Beaverbrook Art Gallery. He is the author of several award-winning books on Canadian artists and art among them biographies of Alex Colville, Tom Forrestall and Mary Pratt, and contemporary graphic novelist George Walker. His forthcoming books are on Christopher Pratt, Jack Chambers, and wood-engraver, Rosemary Kilbourn. As a Special Advisor to Toronto’s Museum of Inuit Art, Tom is assisting the museum — Canada’s only museum and art gallery completely dedicated to Inuit art — to develop and strengthen its collections and exhibitions, and its outreach programs. Alysa Procida is the Educational Coordinator at the Museum of Inuit Art in Toronto, Ontario. Her first experience with Inuit art was at the MIA when she met Kananginak Pootoogook, during one of her first days at the museum. She has a Masters of Arts from the University of Toronto and has also studied at the University of Vermont and University College London. As the Educational Co-ordinator at MIA, Alysa is passionate about successfully engaging visitors with the artwork on display, effectively mediating information about the museum’s collections to viewers, increasing visitor satisfaction and ultimately strengthening their relationship with both the museum and Inuit art. Baffin Island Inuits suffering from tuberculosis during the 1950’s were sent south to three locations including Hamilton’s Chedoke Hospital (site of the former Mountain Sanatorium) to recuperate. Many of them passed the average 2½ year stay by carving. The hospital, still in operation, maintains a collection of these beautiful pieces. Close by is Woodlawn cemetery with its memorial dedicated to those former tubercular Inuit patients not able to return home. Inuit families were typically never notified of their loved one’s death. Formerly the Northern Stores Division of the Hudson Bay Company, the North West Company showroom is an Inuit art wholesale showroom. It is not open to the public. An Inuit art wholesaler showroom, not open to the public. We will have a private tour given by Alysa Procida, the MIA’s Educational Co-ordinator. One of the premier Inuit galleries in eastern Canada, which will feature Inuit artist, Tim Pitsiulak, who will comment on his solo exhibition there. Attendees will be treated to an open house/private viewing of an outstanding private collection which was the subject of an exhibition at the Art Gallery of Hamilton in 2010.